Everyone is always looking for the perfect treat to take to their parties this time of year. Thanksgiving is just around the corner! If you are still trying to decide here is the perfect treat for you! These brownies are not like any brownie you've ever tried before. Everyone I have ever made these for has loved them and has always requested for more! There is goodness on the inside and on the outside. They are so good no one ever really notices that there is oatmeal in them! That is how I can say they are healthy : ) So, try them for yourself. 1. Set aside 2 tablespoons of the butter or margarine. In a large mixing bowl beat the remaining butter with an electric mixer on medium speed for 30 seconds. Add the brown sugar and baking soda. Beat these two until they are mixed well, scraping the sides of the bowl while you mix. Beat in eggs and 2 teaspoons vanilla until they are combined. Beat in as much of the flour as you can with the mixer. Stir in the remaining flour and then stir in the rolled oats. 2. For the filling, in a medium saucepan combine the reserved 2 Tbsp., of butter the sweetened condensed milk, and chocolate pieces. You can cook over low heat until chocolate melts, stirring occasionally. I think it is a lot easier to put it in the microwave for 30 seconds at a time, pulling it out and mixing it every time until you get the right consistency. Remove this filling from heat and stir in the 2 teaspoons vanilla and nuts if desired. 3. Press two-thirds (about 3-1/3 cups) of the oat mixture into the bottom of an ungreased 15x10x1-inch baking pan. Spread chocolate mixture over the oat mixture. Using your hands smash down pieces of the remaining oat mixture. Place these pieces over the top of the chocolate so you can only see little spots of chocolate. 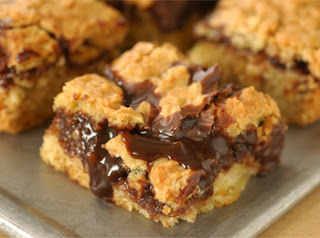 4.Bake at 350 degrees for about 25 minutes or until top is lightly browned (chocolate mixture will still look moist). Cool on a wire rack. Cut into 2x1-inch bars. Makes about 75 bars. These are what the finished product looks like!